If you do not know Imelda Marcos then you’re not living on this planet, who can even forget her thousands of shoes and her beyond compare, rare and luxurious jewelry. If you’re not drooling also over this eye-popping jewelry then you might be an alien who know nothing about a woman’s best friend, just speculating some aliens might have known more. Anyway, I’m making this post as a citizen’s opinion to what is published at PDI online, that the PCGG (Presidential Commission on Good Government) who has given the task to oversee the Marcos ill-gotten wealth is giving statement that the jewelry estimated to worth about P15billion is not for sale, not under this administration. If I were from Sotheby and Christie’s I would be much interested to appraise these stones and have it auctioned, but even then, authorities are holding on to I don’t know. 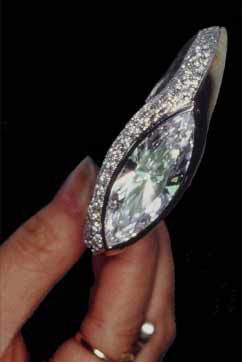 Imelda Marcos’ famous 30.76 ct. diamond bangle bracelet from Bulgari, NY, with a price tag still on it of one Million U.S. Dollars in 1986, I wonder how much this cost now 27 years later. Come-on, these are people’s money, yung perang maging bato, Ja! Sell it out and pay the whooping P4.32 trillion debt of this country, or send every Juan to school so everyone in this almost rotten country cannot be enslaved anymore, maybe this Marcos larceny happen because most Juans had not been educated well. If not to pay every Juan’s debt, then P15billion is more than enough to send millions of poorest among the poor Filipino children to school. Thinking all these things made wipe my spilling saliva, geeez! That would be enough! Nice. tVerns, join ka sa nostalgia tomorrow ha? hope you can join the fun.. Yes after 27 years and still nothing happens, maybe the next administration can do something, hopefully.. Only in my dreams I can wear that jewelry. I can dream can't I.. LOL..
@ Sis Rose, sali na talaga ako, cooking up something to post tomorrow. @ Josie, sana nga Josie... diyos, ko mga mata lang ng mayayaman ang nabusof dito, yung mga mata ng mahihirap lumuluwa na... grabeee! thnks for dropping by. You have got really an impressive post.Imelda jewellery seems fabulous.I like the pic shared by you.Keep posting such effective post.